Programs encourage the Pratt community to experience water firsthand through the eyes of artists and experts. A beach cleanup draws attention to the detrimental effects of consumer waste on the coastlines we share. Years passed we hiked Harriman State Park and took a swim in one of its lakes. The role of cultural practice and design—film, photography, theatre—in water advocacy is a key component of this event. Underwater photographer Keith Ellenbogen, National Geographic Explorer and marine biologist David Gruber, and Academy-award filmmaker Fisher Stevens are just some speakers who have come to Pratt to explore this theme with us. Support from student environmental groups at Pratt—including LEAP (Leaders in Environmental Advocacy at Pratt) and EnVirolutions—shows how young people are working to imagine and design the common future of water. Join us! Title: BEACH CLEANUP: The Summer isn’t over until the beach is clean! Description: Free Food! Kick Off Party from 15:00-17:00 at Rockaway Taco (302 Beach 87th St, Far Rockaway, NY 11693). Hosted by the Pratt Graduate Center for Planning and the Environment. Description: Film screening of two documentary films by Jon Bowermaster. (1) After the Spill – Five years after British Petroleum’s Deepwater Horizon oil rig exploded and sank in the Gulf of Mexico in 2010, has life returned to normal along Louisiana’s coast, or has it been changed forever? (2) City on the Water – Bowermaster’s newest mini-documentary, which is part of Ocean 8 Films’s series Hudson: A River at Risk. Facilitated discussion and reception to follow. Description: Learn about and meet representatives from multiple NYC organizations that focus on water. Every participating group will have a table or tent to show the distinct way in which their organization works with water, waterfronts, and associated communities. We have an exciting line up of these very effective participating organizations, which will be disclosed closer to the event day, so stay tuned to our social media page. Between 12:00 and 14:00, reduce waste by exchanging plastic bottles for a free reusable shopping bag. The Bag for Bottles exchange is sponsored by Envirolutions. 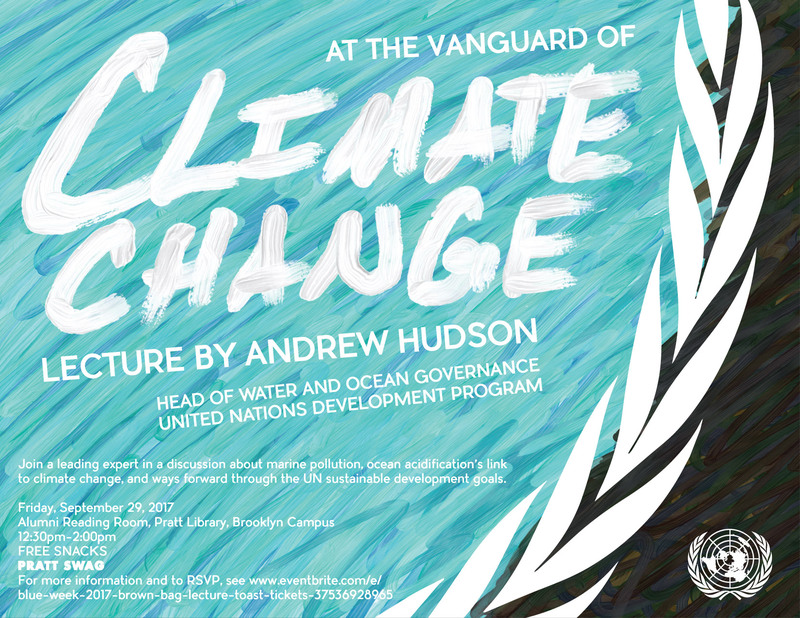 Description: Join a leading expert in a discussion about marine pollution, ocean acidification’s link to climate change, and ways forward through the UN sustainable development goals. 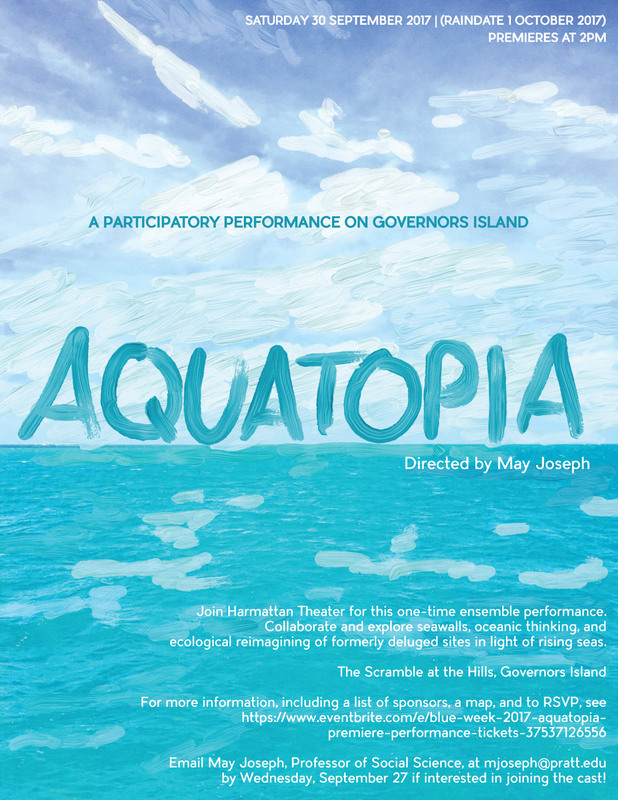 Description: Join Harmattan Theater for the one-time ensemble performance of Aquatopia. Musicians, students, and community members collaborate and explore together seawalls, oceanic thinking, and ecological reimagining of formerly deluged sites in light of rising seas. For more information, click here. If you decide to join this tour, please email tours@harborlab.org with the subject “Pratt Student for Aquatopia Paddle.” Please include your full name, age, mobile number, paddling experience. Your responses will be forwarded to LEAP Co-Chair Ankita Nalavade.